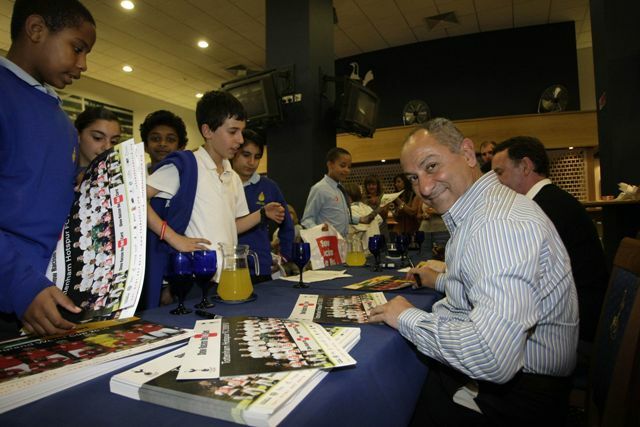 "To have a World Cup winner in Ossie Ardiles at this event is absolutely brilliant. We think the World Cup offers an excellent opportunity for young people and adults to learn about the different nations competing." Show Racism the Red Card continued the programme of events in launching the SRtRC England squad World Cup poster at potential England 2018 bid host venues at Tottenham Hotspur FC. This event was the 8th of the 10 planned events and saw participation from groups of Year 5 & 6 pupils from 3 Haringey Primary Schools in an anti-racist and World Cup themed workshop, DVD screening and Q&A with three former professional footballers. Prior to the start of the event the school groups had the opportunity to take in a short tour of White Hart Lane, including the changing rooms and pitch-side, thanks to Tottenham Hotspur FC. Leroy Rosenior, former professional footballer and manager and a coach and education worker, led the educational session which featured activities including an audience generated definition of racism, an exploration of terminology, positive global and cultural influences on the lives of the young people and an activity designed around images of Africa and where those images come from. The audience participated readily in the session and SRtRC staff were impressed by the breadth of the young people’s knowledge on the subject and their attitudes. Following the education session a short break was held before moving on to a screening of the DVD. At the end of the film Leroy spoke briefly on some of the themes raised by the film, before the event moved on to the Q&A session. For the first time in the history of the Show Racism the Red Card campaign, we had a World Cup winner participate in the event. Tottenham Hotspur FC had been able to ask former player and manager of the club Ossie Ardiles to attend and he happily answered questions from the audience. As did Leroy and another Spurs legend, Paul Allen, who made over 290 appearances for the club and now works for one of SRtRC’s major sponsors, the Professional Footballers’ Association. Show Racism the Red Card’s Regional Manager for the South & South East, Sarah Soyei was also able to join the panel. The questions were very good and the panel members handled them very well, resulting in an interesting and informative session. SRtRC would like to thank all who participated and Tottenham Hotspur FC in particular for hosting the event; the campaign would particularly like to thank Tony Stevens and Fola Salako for all of their hard work in the build up to the event; Andrew from Action Images for photography and Stage Two for the AV provision.